Une autre manière de faire des murs végétaux. Élégant! The built and natural environments merged to form something new and amazing in Miami: The Perez Art Museum. 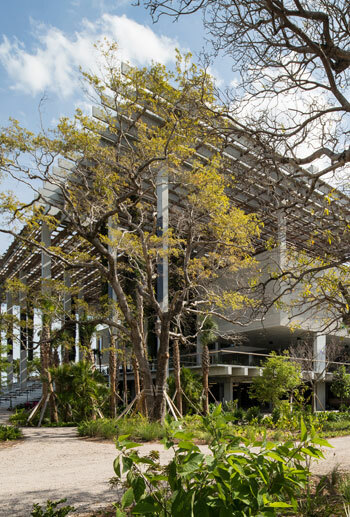 One of the most fascinating recent uses of integrated design, the museum features a hanging garden and a complementary, tropical landscape filled with native plants and irrigated by the building itself. Designed by architects Herzog & de Meuron and landscape designers at ArquitectonicaGEO, the museum is a prime example of multidisciplinary team-driven sustainable design. Exploring the museum from the ground up shows us how the project just builds one sustainable layer upon the next. 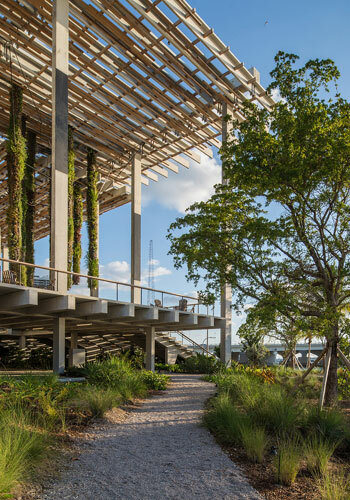 As ArquitectonicaGEO explains, given the museum is close to the Biscayne Bay, it first had to be elevated to meet flood and storm surge requirements. Suivant BEEING HAPPY IN THE CITY, IS IT POSSIBLE ?